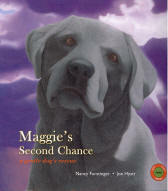 Maggie's Second Chance is a delightfully illustrated children's book which inspires children to help animals in need. In the story, we follow the life of Maggie, who was abandoned in a locked house, rescued, and finally gets a forever loving home. One of the things that impressed us about this book is that it helps preserve a child's sense of empathy for all living beings. As the publisher says, most children have a deep sense of what is ethically right, and this book definitely will reinforce that inner understanding about the way the world should really be. The books ends with a page about how to help other animals in need. Maggie's Second Chance would make a wonderful gift for any child that would be appreciated for many years. Nancy Furstinger, the author of nearly one hundred books, many about animals, was an editor at two children's book publishing houses. She shares her home with three rescued dogs (including Jolly, the real Maggie) and seven rescued house rabbits. Joe Hyatt is the illustrator of Buddy Unchained, an award-winning picture book used in schools and libraries around the country. He has a career painting portraits of dogs that was inspired by the portrait he made of his yellow Labrador retriever, Nola. He lives in California with his three rescued dogs, Nola, Turtle, and Holiday.